To those of you who suggested i try jojoba oil as an eye makeup remover, i can’t thank you enough. Heres my favorite way to use it! Not only is jojoba oil great to use as an eye makeup remover alone but it also works great as a general oil cleanser (find my post on the double cleanse here). Those of us with oily skin sometimes think that putting more oils on it is the worst thing you can possibly do but, my skin at least, actually really appreciates it. If i’m using the jojoba oil just as an eye makeup remover i like to squirt a line of it on a cotton pad and press it into my lashes for 30 seconds or so and gently massage it in and start wiping away. To use it as an all-over oil cleanser i’ll usually do a preliminary wipe with a face wipe and then i squirt a little oil into my hands and start massaging it into my entire face and eye area. Once i can see that most of my makeup has been broken down and emulsified i use a hot wet washcloth and start to wipe the oil away, rinsing the washcloth out in-between wipes. 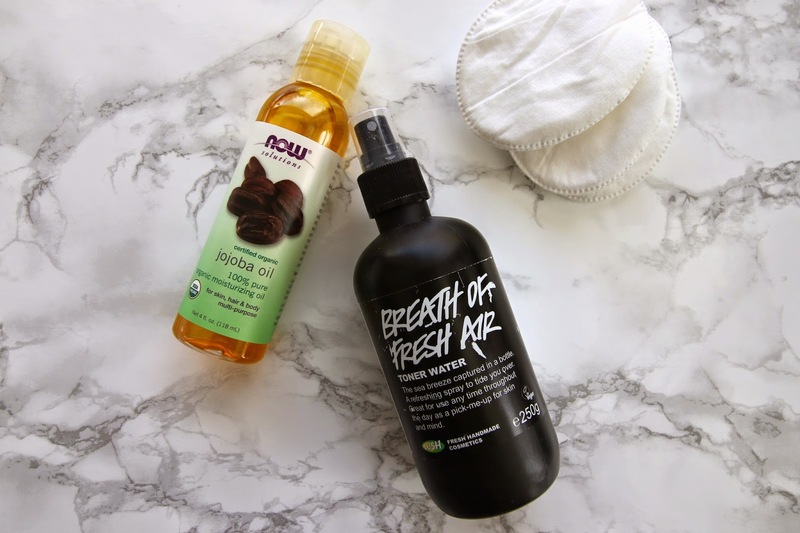 Once i’m done with the oil i like to use the Lush Breath of Fresh Air toner water to get rid of any excess oil left over and get my skin toned and prepped for whichever moisturizer my face might be needing! This duo is great because they both do their intended jobs while being nourishing, toning and about as natural as you can get. I know using more natural products can seem daunting at first and they might seem like they’re not going to be as effective as the chemicals that you’re used to but once your skin has adjusted, it will really reap the benefits of all those nutrients. For my skin at least, changing up my skincare to include items like this has really been quite beneficial and my skin is only on the up and up.